TextArea class allows you to create a text area in which you can input and edit multiple lines of text. TextArea is able to generate text and key events as the TextField does. Its constructors and useful methods are summarized below. creates an empty text area. creates an empty text area with specifying numbers of rows and columns. create a text area with default text and specifying numbers of rows and columns. appends text to the text area. reads text from the text area. reads selected text from the text area. inserts text to the text area at the specified position. replaces a rangle of text from start to end positions with the new text specified by text argument. selects text in the text area from start to end positions. places text to the text area. The old text will be replaced. 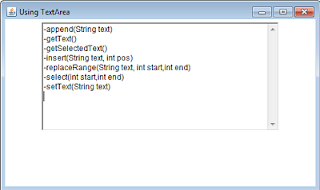 In the example code below, we create a TextArea with 10 rows and 50 columns. To make it bigger you need to increases its row and column values. The scroll bars are automatically attached to text area when the input text reaches the rows or columns limit.